What is the Snake Cube? What is the Snake Cube? The snake cube is a chain of 27 cubes. 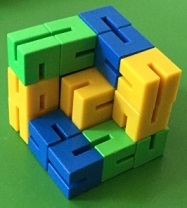 The cubes are connected by an elastic band running through the middle. There are 17 groups with two or three cubes shown in the drawing. 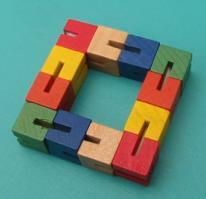 The aim of the puzzle is to arrange the chain in such a way that there will be a 3x3x3 cube. 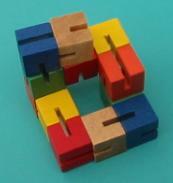 You can only solve the snake cube systematically. First you number the pairs or triplets of cubes from 1 to 17. You see triplet number 1 on the left. While ordering you should always keep the same orientation in the room. You fix this orientation by a coordinate system with x-, y- and z-axis. the -x-axis. If you see the simple diagram you may wonder why this puzzle is so difficult. The reason is that you often have to go back to the last branch. It is difficult to find this place. There is another solution. You start at the end, but then you will have technical problems. The middle vertical triplet is late and can be laid properly only with difficulties. There are two more solutions because of symmetry. You can see one of these in a sequence of drawings. I 've got this nice cube chain. I don't know the name and the manufacturer. Obviously it is similar to the "Kibble Cube". There are two slits turned around 90° in opposite faces of one cube. The 12 cubes are connected by an elastic string along the centre axes. The first and the last cube have a knot inside. You can give the cube chain any direction in this arrangement. There is a competition for pupils of Primary Schools in Germany called Känguru-Wettbewerb. A chain of 20 cubes was the prize in 2017. Paul built the cube body of 20 cubes. If you would have 27 cubes instead of 12 or 20, you could lay the snake cube above.